At Caliber Collision, our eyes are always on the horizon, looking ahead for ways to restore the rhythm of our customers’ lives – both on and off the road. We’re proud to say our Recycled Rides program has become one of our most successful ways of doing precisely that. Every day, families get blindsided with bad luck, left without a means to get to work, see the doctor, or stock up on groceries. And that’s where Recycled Rides comes in. Over the past 5 years, we’ve gifted nearly 130 vehicles to families in need of reliable transportation, and we’re gearing up to make 2017 our best trip yet. In 2016 alone, we were able to provide a record-breaking 48 veterans and families in our local communities with newly refurbished vehicles all across the country. In a massive coordinated effort, insurance partners, parts suppliers, local businesses and some very generous teammates all came together to help us pull this off. Among our recipients were military veterans, firefighters and first responders; heroes who truly deserve the gift of getting back on the road. 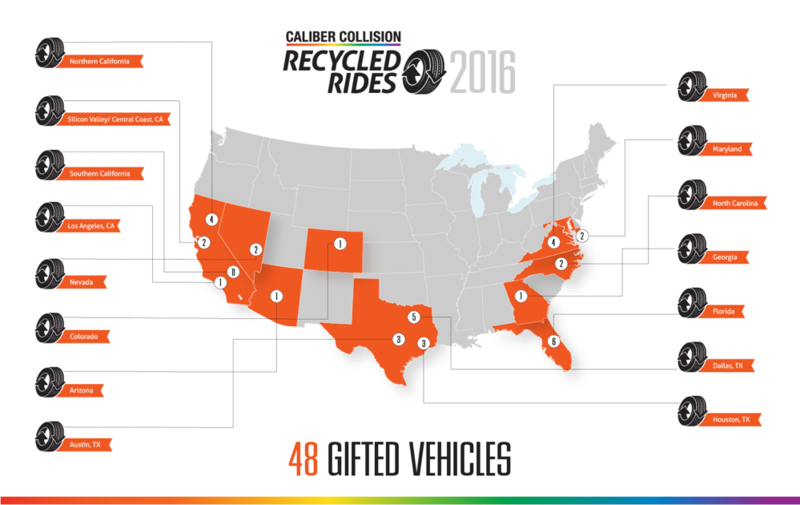 With 2 giftings completed and 50 planned for 2017, we’re expecting Recycled Rides to really put the pedal to the metal this year. As we continue to expand, our teammates across the country are committed to restoring not only rhythm, but hope to these individuals’ lives by removing barriers caused by lack of transportation. We look forward to setting even higher goals down the road, and are always grateful to our loyal customers for supporting us in these efforts. With your help, we know there’s no limit to the number of lives we’re able to restore.